The effects of this past NYFW are still lingering, and part of me feels like it's still going on--the subpar Marc Jacobs collection (at least in my opinion) that was meant to dramatically close the week didn't do the trick, so did fashion week actually end?? I then realized that London Fashion Week already ended, and I then wondered why this happens almost every season. Why does my fashion-oriented mind always skim over this week? Big names like, as I said in my previous post, Marc Jacobs and Alexander Wang aren't included, but that doesn't make any of the clothes less amazing. Or does it? I always feel more underwhelmed with London's shows; maybe this is because it's squeezed between two huge fashion weeks--New York and Milan. But New York was underwhelming last year, except for the fact that pajamas were deemed ~fashion~ in many of the shows. Maybe it's because fashion journalists and bloggers aren't dying to write about LFW, so less articles are produced from this season, except for when Burberry does anything more than ordinary (which is common for the fashion house). Setting this ~strange phenomena~ aside, LFW always slips my mind. When the last model walks down the closing Marc Jacobs show, my first question is where's Gucci, the brand that always opens for Milan. But LFW deserves the love, too! It's home to a ton of emerging designers that are amazing me with their raw talent, and also those classic London houses (think Burberry and Vivienne Westwood) that seem to drive the week. But I went a different route this year, choosing only one designer I've reviewed in the past. I've come to realize that designers I've never been familiar with are so talented!! It's nice to start looking past our favorite designers and appreciating all of them, because you never know which ones will become your favorites later on. 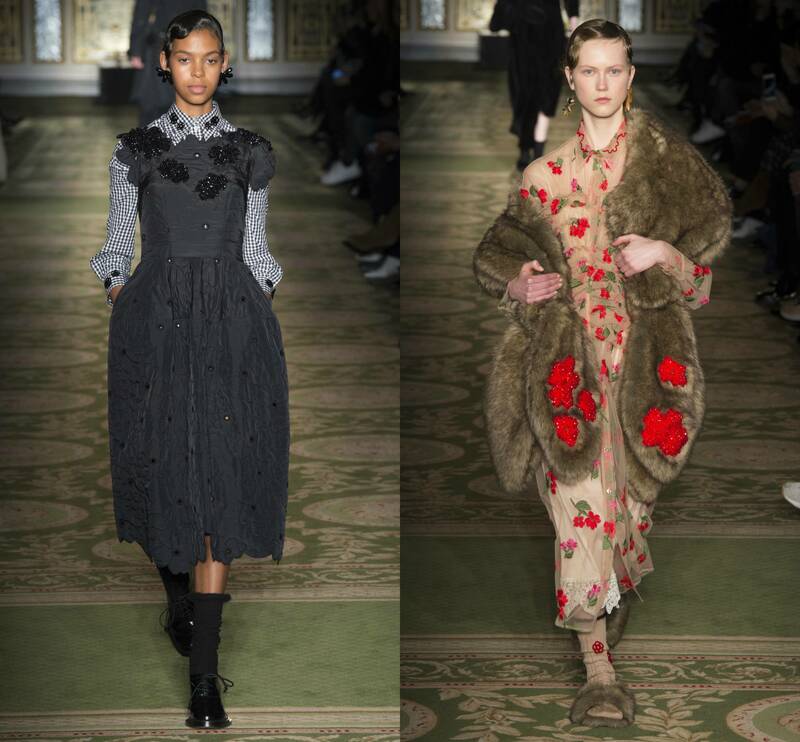 I've always been attracted to Simone Rocha's delicate form of beauty that always makes an appearance in her collections season after season, and this is probably why I keep going back--it's refreshing to have at least one (female!) 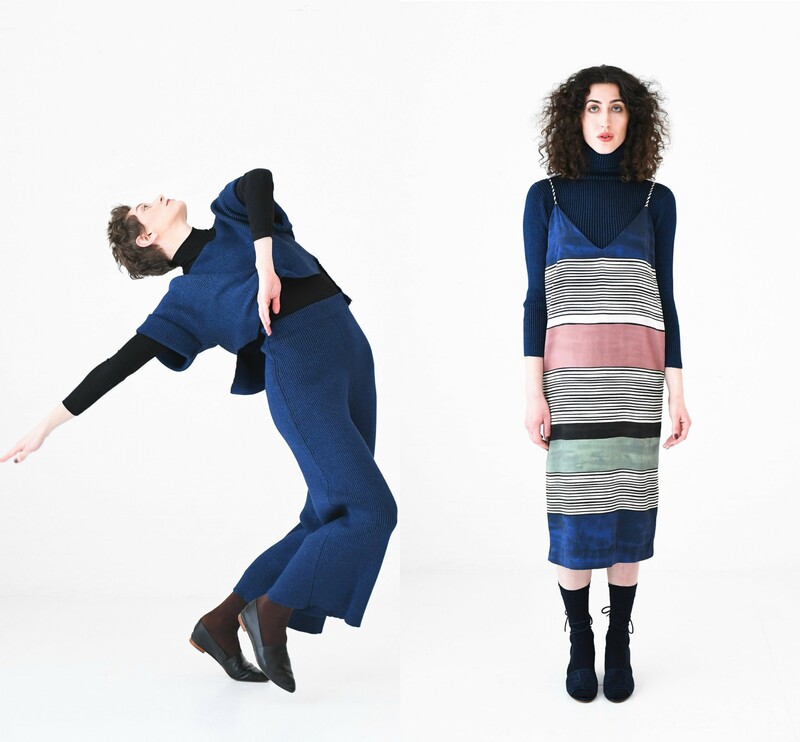 designer who knows how to get in touch with her femininity with the clothes she creates. We usually see pink flowing dresses, romantic necklines, and draping layers of tulle and silk producing more-than-beautiful silhouettes, but this season we saw something a bit different. She didn't completely stray away from her normal aesthetic--tulle, intricate floral patterns, and shin-grazing hemlines are still included in the 42-piece collection, but other themes seem to be at play here. 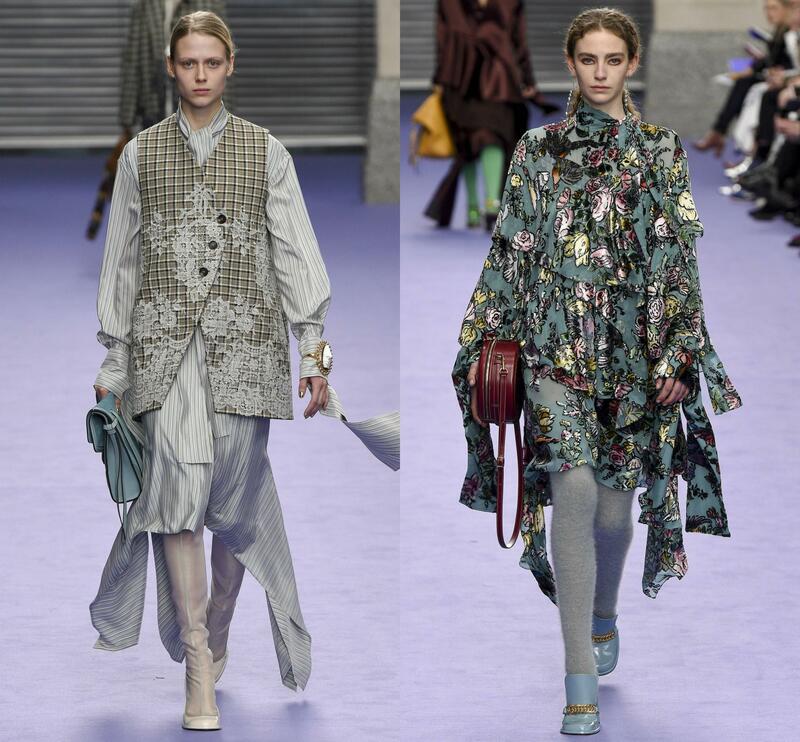 A bit of masculinity with the boxier shapes, a bit of utilitarianism with all the coats that act as dresses, and a bit of chaos with the unique layers that range from fur draped over a chiffon dress to a half-coat-half-blouse layered over a white button up and ruffle pants. 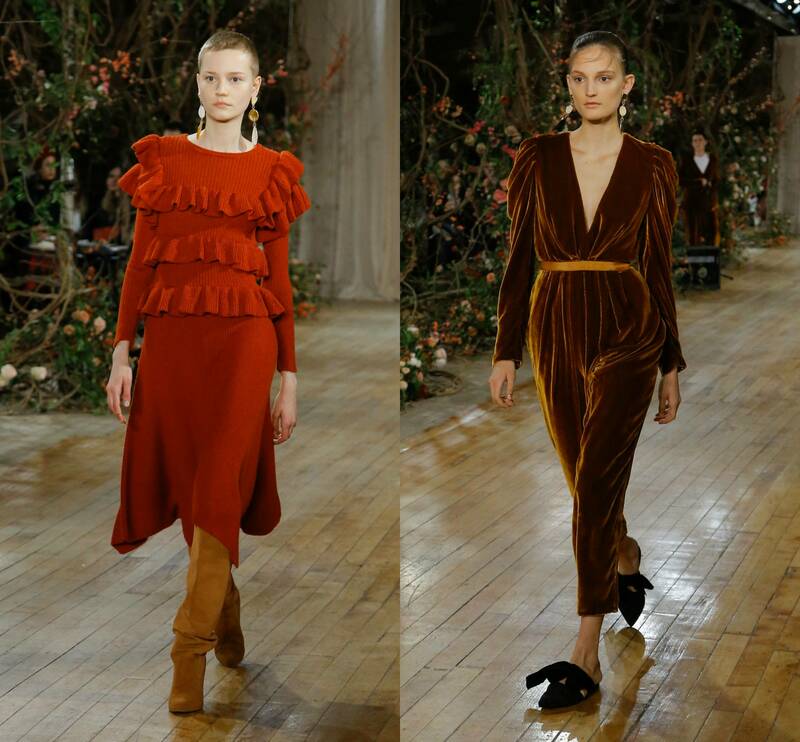 A bit Victorian, a bit edgy, and even a bit military, which are themes Rocha usually doesn't play with. But she does include that soft femininity we all love! 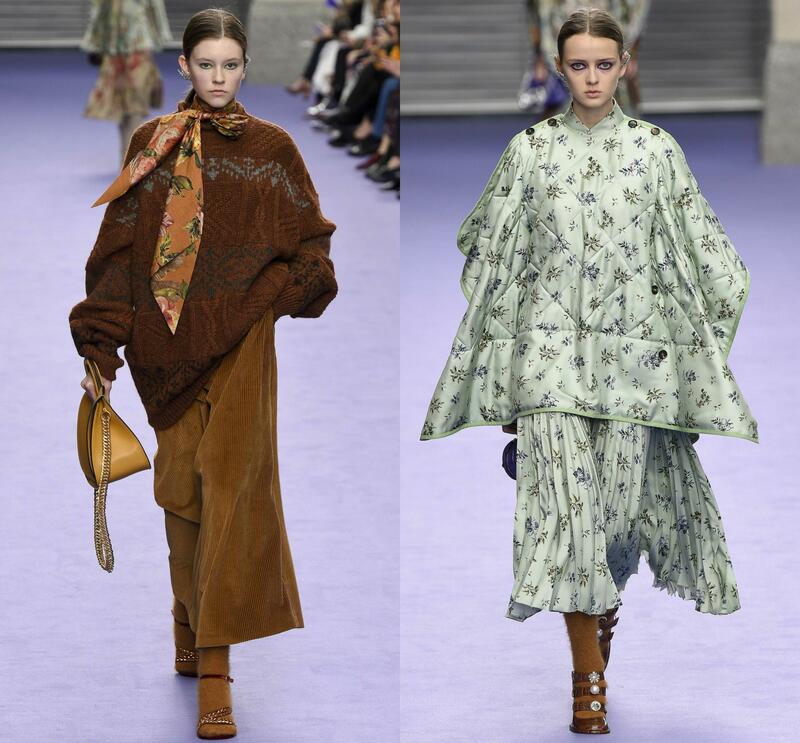 Whether it was fur stoles belting an oversized coat or flowers embroidering a rigid suit, her true intentions of female empowerment still exist in the collection--is this why I keep coming back? 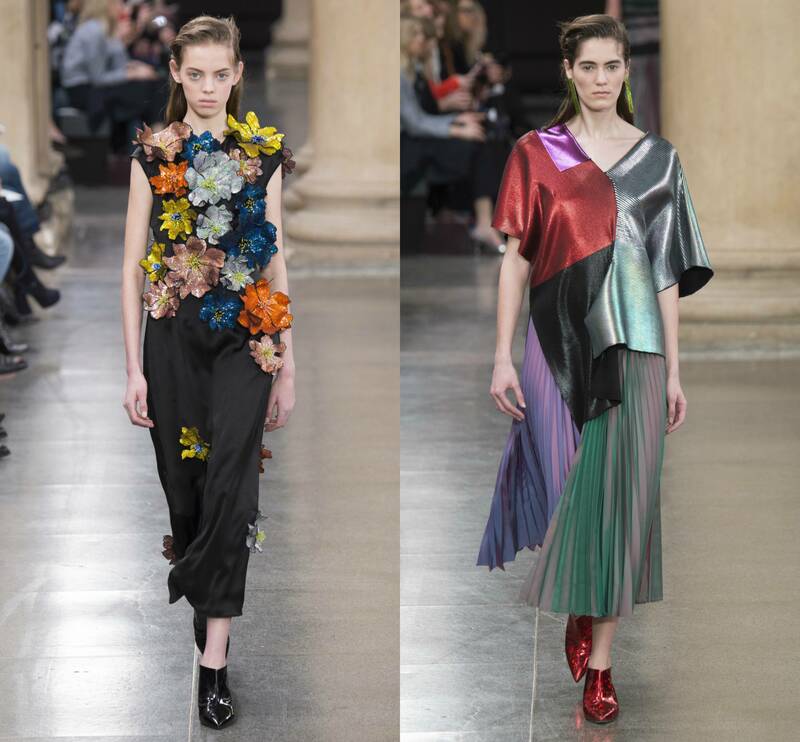 Preen by Thornton Bregazzi reminded us that scary can be good! 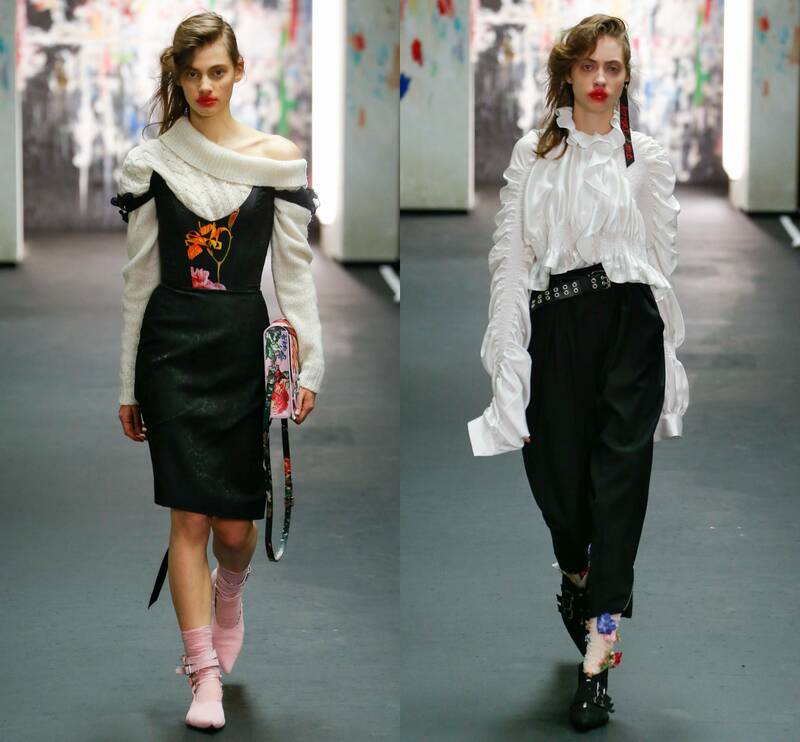 Part of me believes that's the only reason that attracted me to this collection--the clown inspired show filled with ruffle sleeves and smudged red lips immediately grabbed my attention. It's important to know that one of my biggest fears (next to wasps) are clowns, so it's a bit strange that I picked this collection to be deemed one of my favorite four LFW shows. 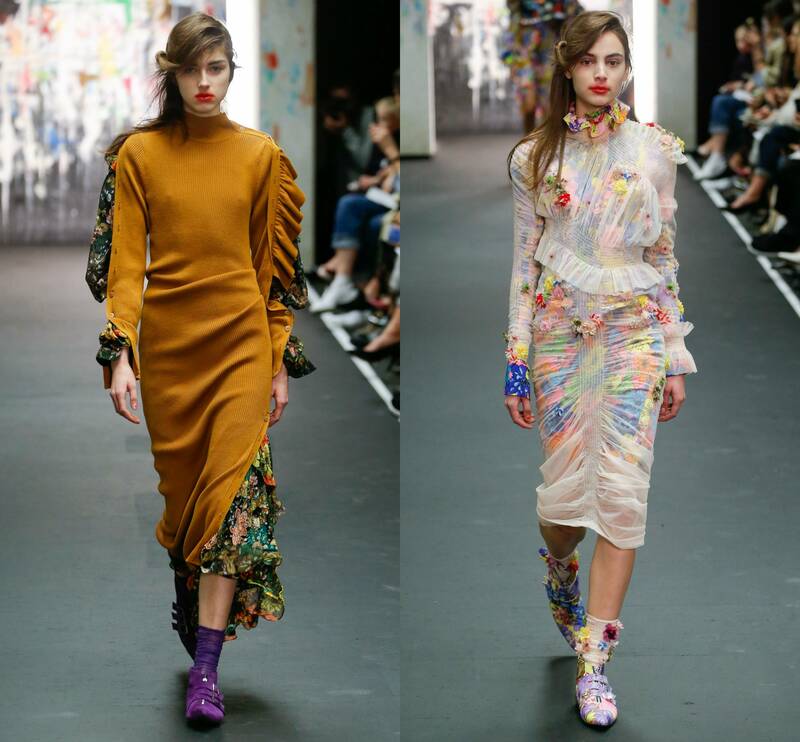 But they made clowns look friendly and impeccably cool at the same time, with lots of bright floral themes clashing with oversized, draping-over-the-shoulder garments and sheer fabrics layered under flashy bustiers. Maybe this is what I needed to get over my fear--being exposed to it in the form of fashion. I've never been a huge fan of Mulberry--their overly-English and equestrian aesthetic never inspired me, unlike other collections that go over the top; this brand always seemed too simplistic. But this season I decided to embrace their aesthetic! 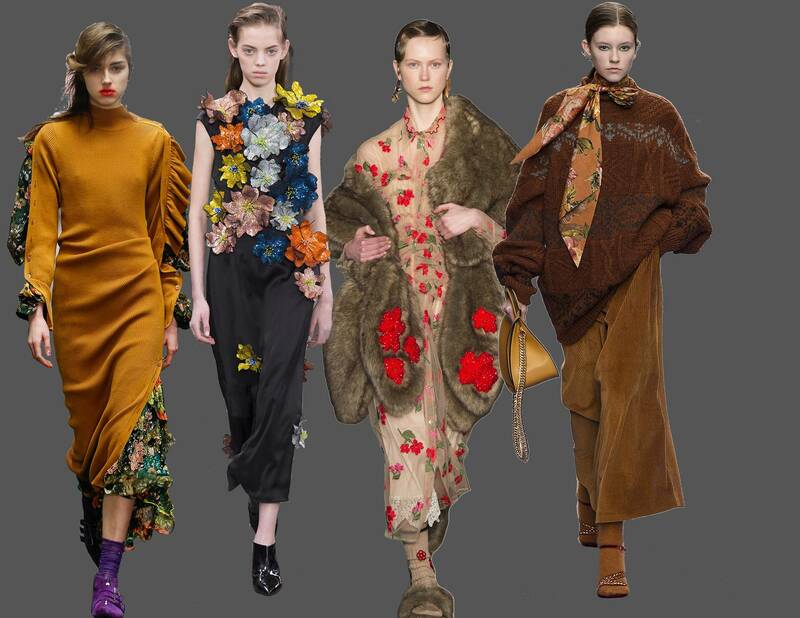 They revamped their look with oversized coats, more-is-more layers, and beautiful floral prints (an LFW theme, perhaps?) displayed on flowing Gucci FW15-esque dresses (the first season with Alessandro!!). 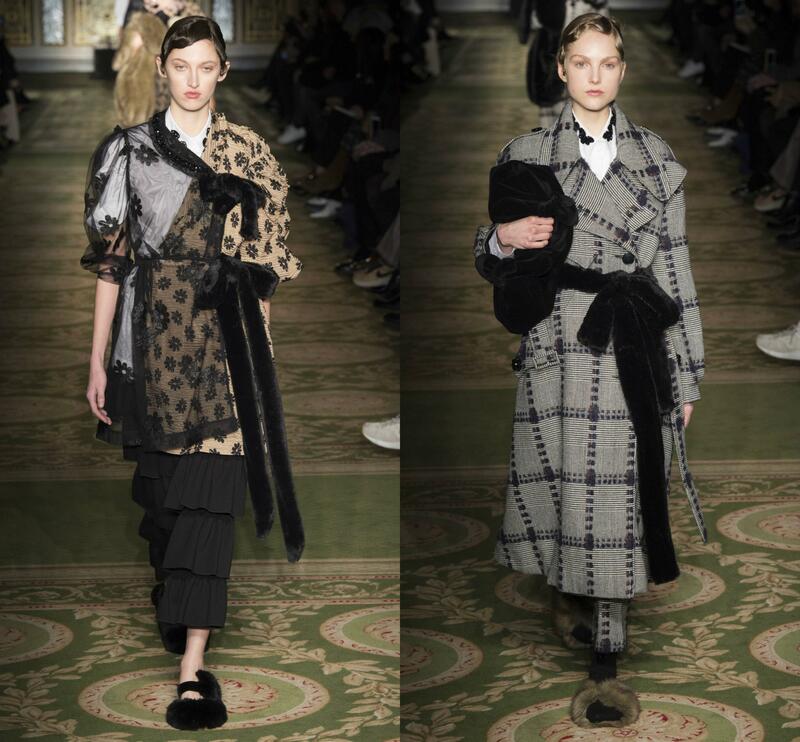 Quilted capes and completely-check outfits made the collection true to Mulberry's roots, but the addition of pussybow blouses, asymmetric hemlines, and clashing textures gave it a modern and retro feel that made me finally start liking the fashion house. Props to them for making equestrian finally look appealing! 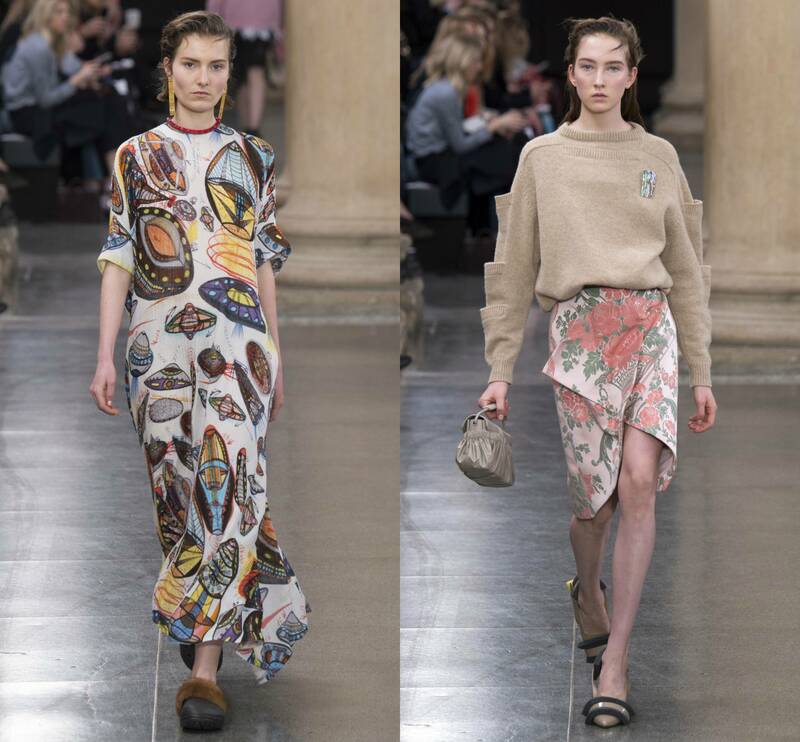 Christopher Kane's runway was all over the place last week, but it seemed to be the least chaotic of all the shows, which is shown through the sleek silhouettes and conscious craft put into the collection. Inspirations were spontaneous, but execution was not, which makes a beautiful juxtaposition that everyone always loves in a fashion show. UFO prints covered simple tops, skirts, and dresses; Victorian-inspired floral patterns were seen on pencil skirts and suits; asymmetrical dresses and pleated skirts shined with metallic fabrics of every color; even huge sequined flowers were attached to sophisticated midi dresses. This combination of clashing themes makes us think: is it about space? Is it a modern take on the Victorian era? Is it a glimpse into what our future will look like in fashion? And I think that's the entire point--there is no one inspiration; his main inspiration is really just about making clothing that he found beautiful. Fur-lined crocs aside (am I still the only person in fashion who can't get on this trend? ), Kane's lack of inspiration made this collection all the more inspiring and probably one of my favorites of this season. See all of my show reviews from previous seasons here. From left to right: Adam Selman, Mara Hoffman, Tibi, 3.1 Phillip Lim, Creatures of Comfort, Ulla Johnson. Photos from Vogue.com. Collage made by me. Yes, this sudden turn to politics that used to not be incorporated in fashion (even though fashion is always more than fashion) may be half the reason why I fell in love with clothes all over again this New York Fashion Week, but the connections dug deeper than the political statements; the love for smaller designers emerging from the shadows grew fonder. I didn't include any big-name designers like Alexander Wang or Marc Jacobs in my biannual show reviews, and maybe it was because the two collections were a bit underwhelming compared to their previous seasons, but it was also because I wanted to include those designers who don't necessarily get the spotlight. They were just that good. Fairly new (and female!) 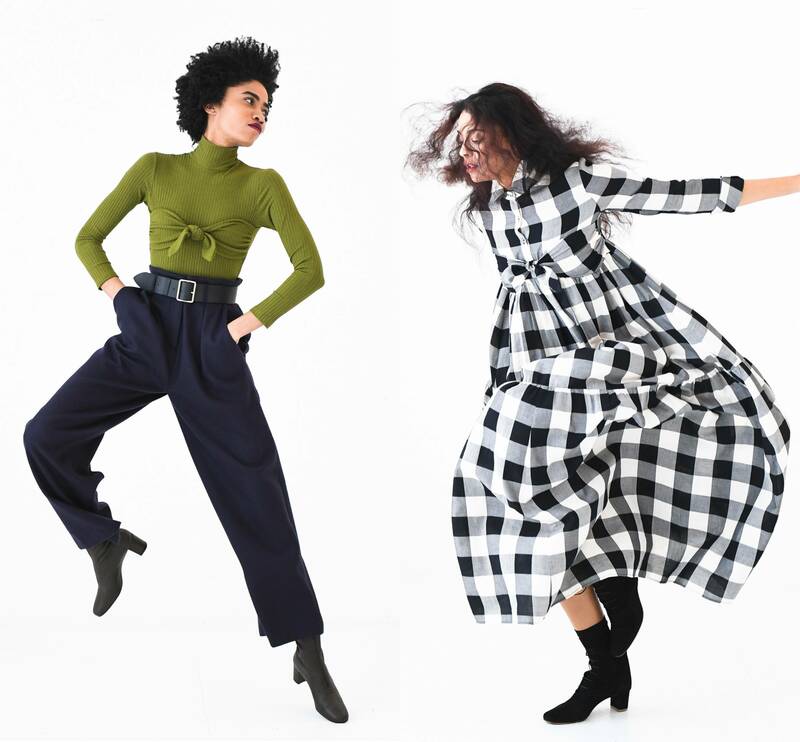 designer Ulla Johnson eased the transition into Trump's presidency not with blatant mottos of feminism, but with lush fabrics, heavy knits, and loads of pants and shin-grazing hemlines. Politics weren't obvious in the clothes, but the designer is obviously political, where she designed shirts with We Are All Immigrants sprawled across the top. Knowing this allows us to realize her collection still fit in with this activism in the subtlest of ways. 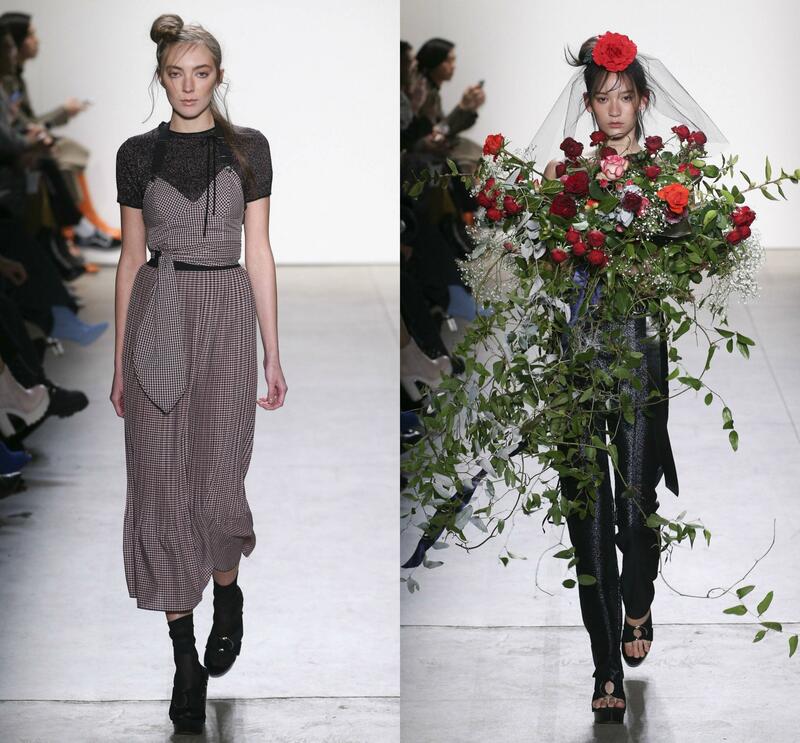 A rose color scheme combined with frilly silhouettes and pink roses, of all flowers, surrounding the runway created a 21st century Eden that instead praises femininity and women. Fight for feminism with femininity. Try saying that ten times fast. More obvious collections strutted down the runway, one of them including Creatures of Comfort, a brand I fell in love with last season but wish I had years before. 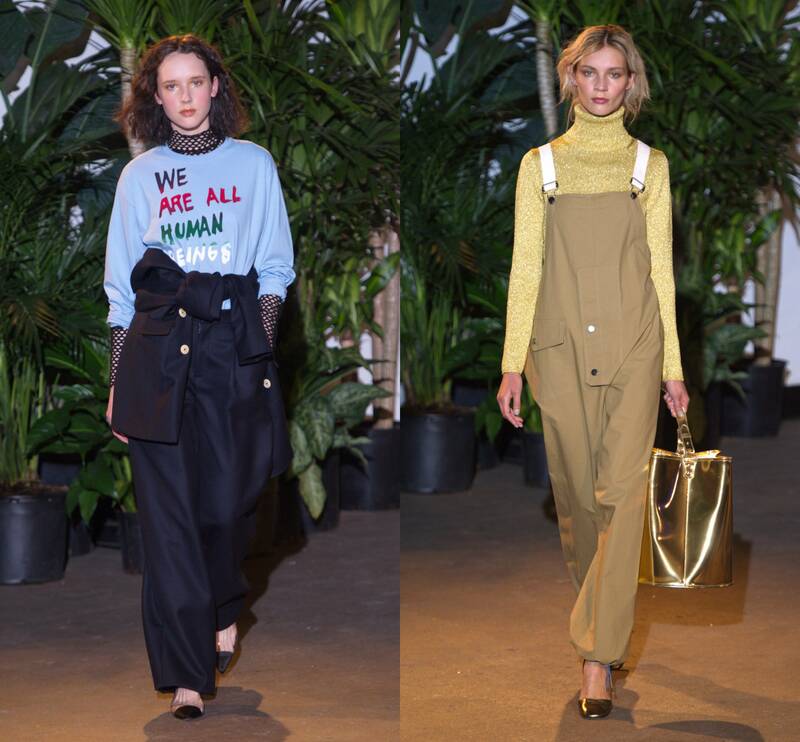 We Are All Human Beings printed on a few tops make the obvious even more obvious, but the rest of the collection still carried a sense of flashy glamping--glitter turtlenecks, utility overalls, layers that seem more than necessary, and hemlines that don't creep above the shin, coming in the forms of frocks, relaxed trousers, and a-line midi skirts. Those velvet slides paired with glitter socks make camping seem strangely exciting. Business professional was all the rage on Tibi's runway (another new name on Fractured Aesthetic! ), where suits took several different forms and make a 9-5 job look, well, cool. 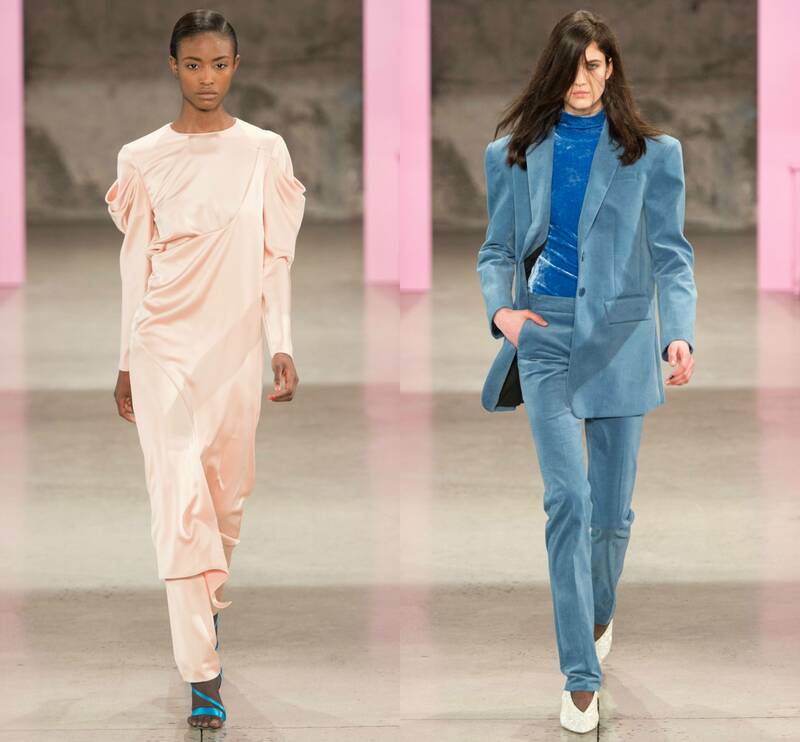 This could be an indirect shoutout to #pantsuitnation, but if these weren't the designer's intentions, I still would love to hop on the blazer train. Velvet pantsuits, plaid blazer and skirt sets (Dana Scully, anyone? ), and modest hemlines (are we seeing a recurring trend?) 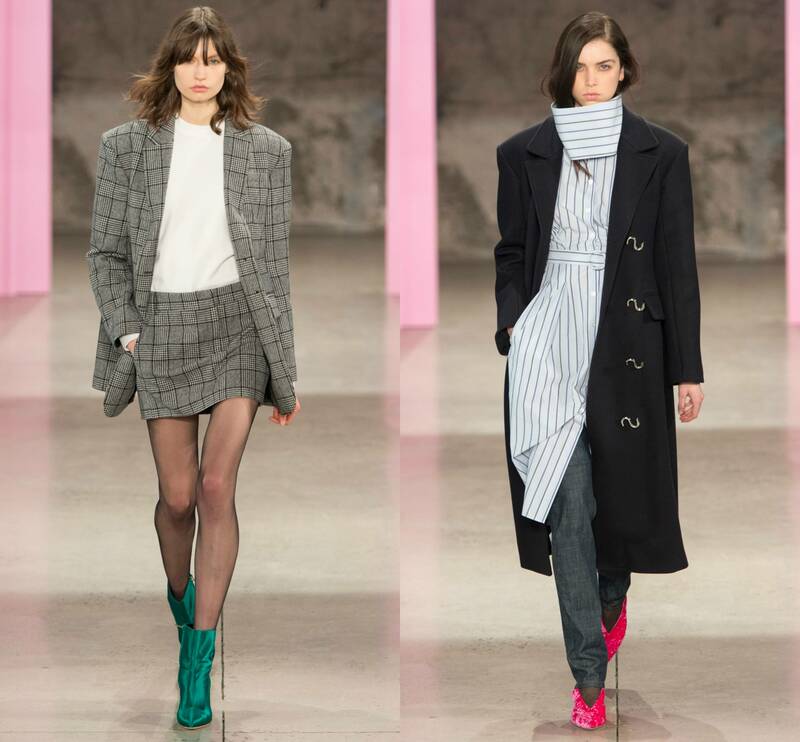 filled the runway, and Amy Smilovic knew just how to make these timeless pieces not boring--neon shoes in lush fabrics, ruffles to make those midi and maxi dresses more fun, and neck protectors not connected to the rest of the bodice, kind of like those convertible turtlenecks from Madewell. What a cool way to make your day job look like an actually fun 40+ hour week!!! 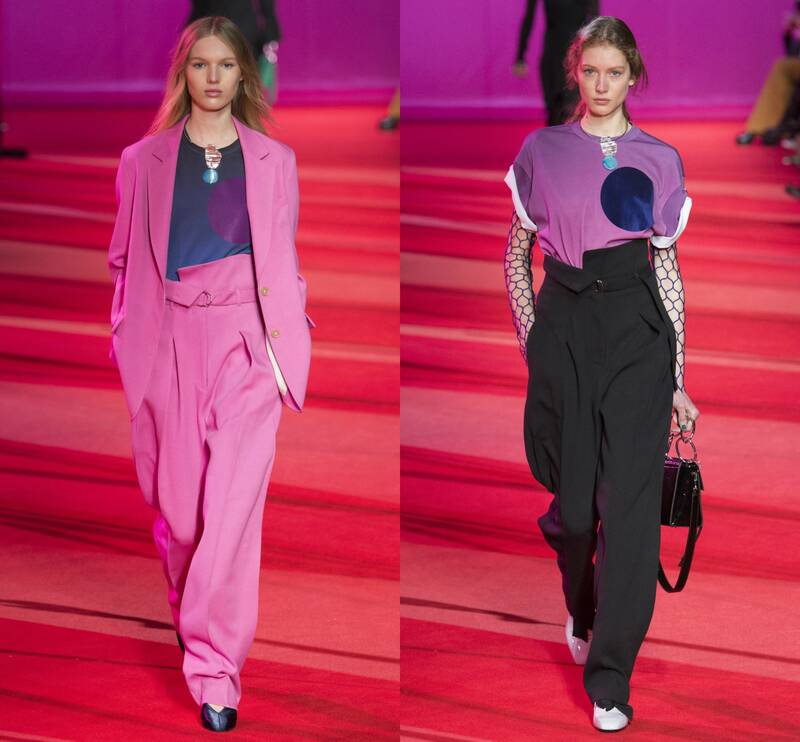 3.1 Phillip Lim created a collection just in time for Valentine's day, or maybe the excessive amount of pink was meant to represent girl power in light of recent events. 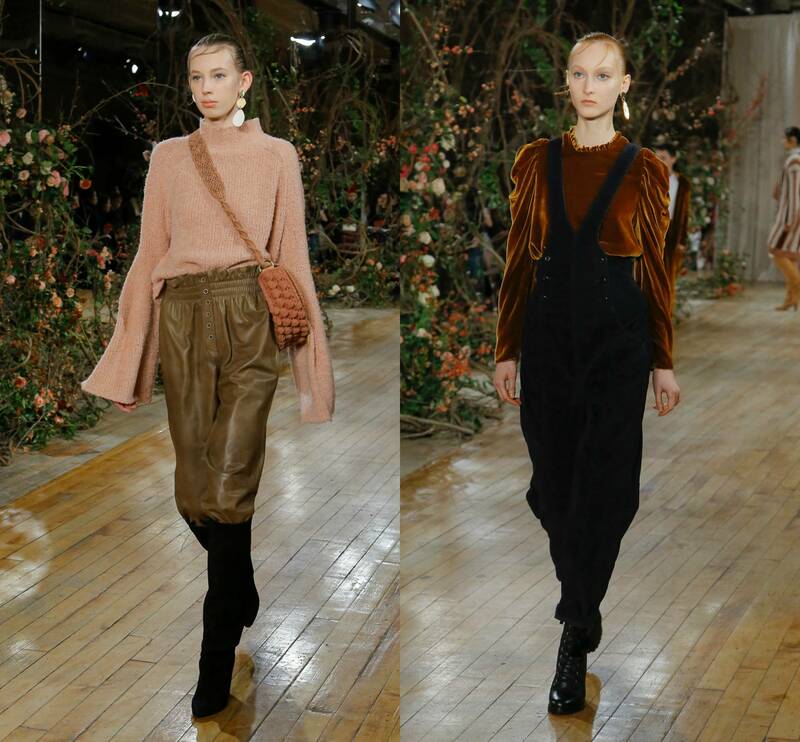 Either way, the collection represented a sort of romance, similar to Ulla Johnson's, but in a flashier manner with asymmetric hemlines, chunky knits seen here and there, and fishnet tops layered underneath t-shirts and leather bodices. This kind of romance definitely took a feminist approach, with baggy pantsuits (a trend this season, perhaps?) replacing thigh-grazing skirts. 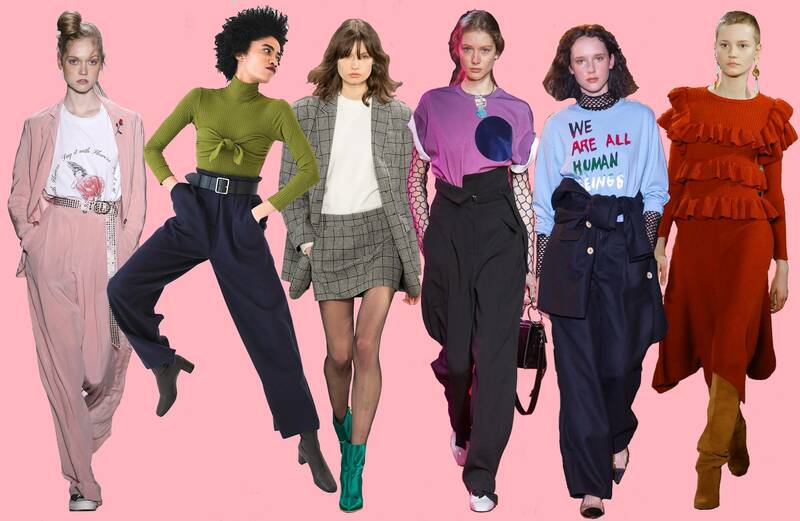 So maybe the collection was meant to represent empowerment, because who doesn't feel a massive amount of female agency when oversized pants can still be fashionable? This is the third time (in a row) that I've included Adam Selman on my NYFW show reviews, so does this mean he's officially my favorite New York-based designer? His Fall collection could definitely make that statement a fact. This is also the third time in this collection of reviews that romanticism was played with in a show, similar to Ulla Johnson and 3.1 Phillip Lim, but done in a completely different manner--not rosy, not flashy, but in a feminist goth way, where sheer fabrics met floral embroidery and leather and denim were common materials seen on the runway. 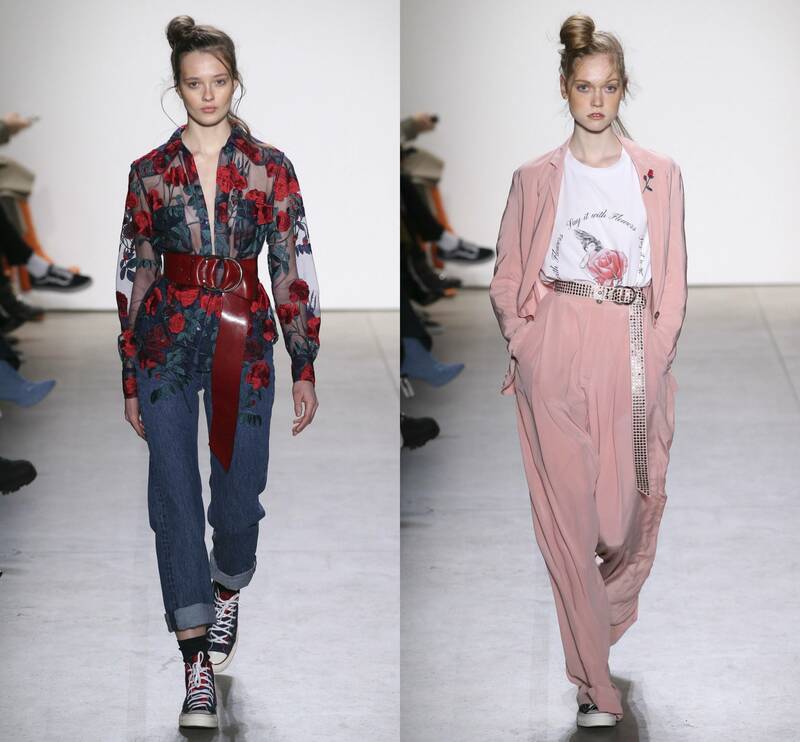 The rose motif softened the biker-chic theme that Selman was working with, but the thorns on the roses were revealed through the somewhat gritty collection that included Chucks, denim jumpsuits, and an actual bouquet of roses acting as a top that was more grotesque than romantic. 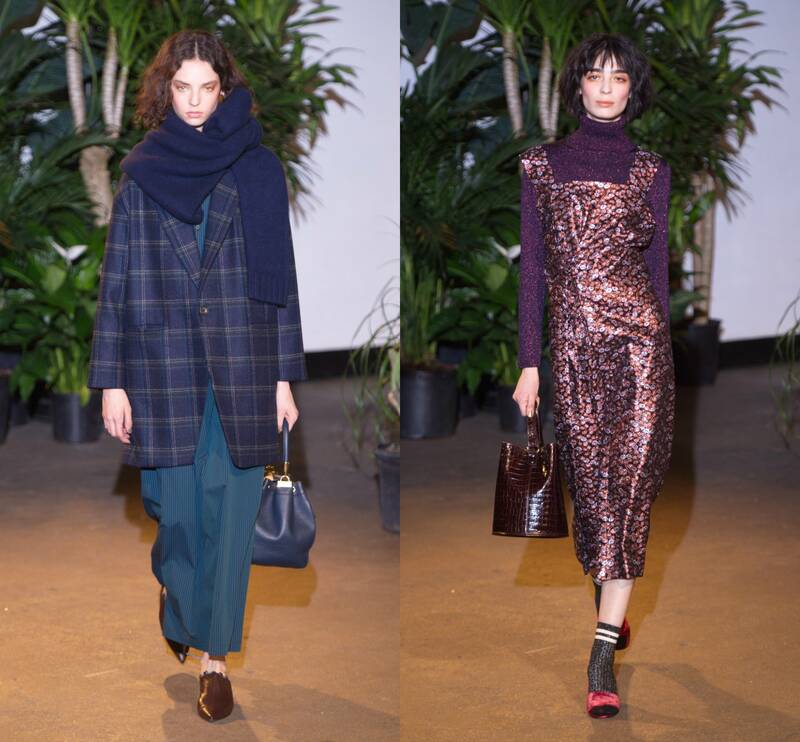 Selman always knows how to make a statement, with '90s grunge driving his Fall 2016 collection, disco driving his Spring 2017 collection, and the ugly side of romanticism (Edgar Allen Poe, anyone?) driving his newest collection. This load of contradictions is actually sort of beautiful, no? 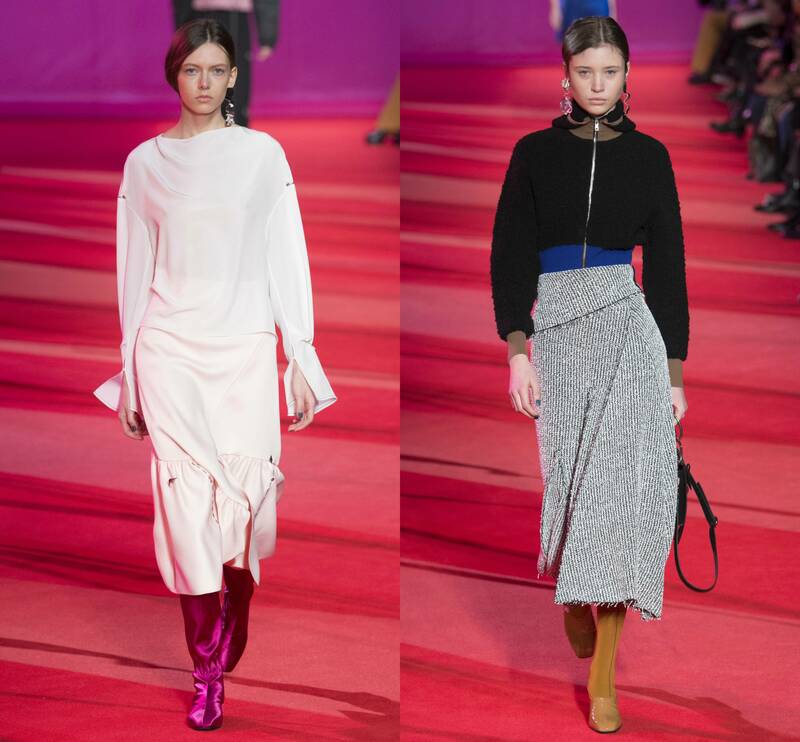 In the past, I've always closed my reviews with my favorite show of the week, and this has usually been about the clothes--I closed Fall 2016's PFW with Valentino because the ballet-inspired collection spoke to me on a completely new level. But with Mara Hoffman, it was hardly about the clothes, and her show proved the statement I made earlier in this post, that fashion is always more than fashion. This fashion week has allowed designers to speak up about the current political situation going on in America because NYFW attracts so many important viewers, so what an amazing way to spread the word! Hoffman jumped in on this activism and went all out, having the national co-chairs of the Women's March on Washington give a tear-jerking speech right before the clothes were revealed. Then the actual show began, showcasing a mix of models and contemporary dancers (representing all races, ethnicities, ages, and gender identities!) wearing Hoffman's overly simplistic and comfortable collection that can actually breathe, something I've wanted to see in a fashion ever since Spring 2017 of NYFW happened. The combination of walking and dancing of the models (which you can watch here to get the real experience) told us that these clothes are clothes we can move in, can dance in, can be activists in. Comfy layering combined with shapeless dresses, knits in every form, and pants we can do extensions in filled the runway, and dancers proved that these clothes could actually move by moving their bodies to feminist anthems and chants of spoken word that gives a shoutout to female empowerment. There's been an argument floating around that fashion shows including models walking in the clothes is necessary to show how the clothes move on our bodies, but dancing in them is even more effective--maybe this should be a new requirement for fashion week (remember Opening Ceremony from Spring 2016?). Check back in the next few weeks for reviews from LFW, MFW, and PFW. There's been this concept going around for the past few months that jeans are dead. Even pants have made it to this list!! My ex jeans-hating self loved this idea--I finally won't be the only one who dreads putting leg-restraining articles of denim on in the morning. But then this strange phenomena occurred and I actually started to like jeans! This started with my white cropped jeans from Mango I bought almost a year ago. I never put them in the "jeans" category because a) they're white and b) I never felt like I was wearing jeans--I felt more like I was on vacation in the Bahamas. So cue my next pair! I bought these wide-leg jeans from Madewell last summer, which came a step closer to real jeans because they were made of blue denim, but also were a step further from real jeans because 2/3 of my legs felt like they weren't wearing pants. 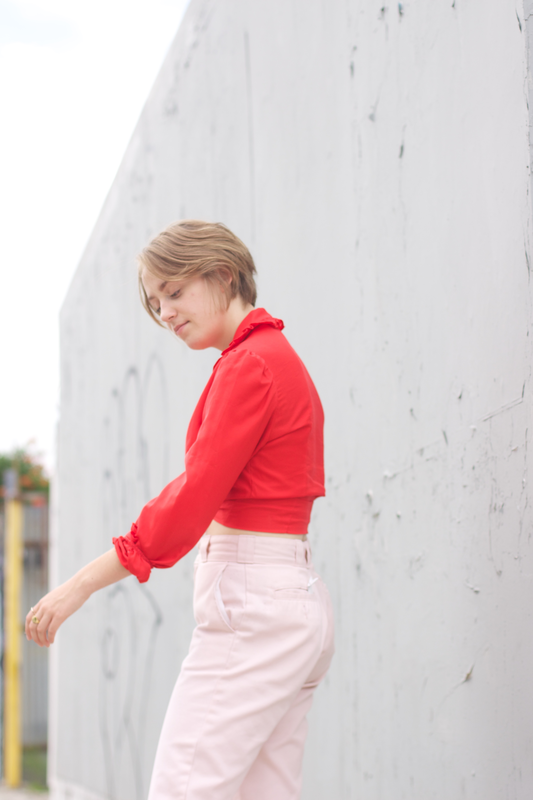 Wide-leg pants are so liberating! And then I finally bought my first real pair of jeans that I actually adored (and still do!). Levi's, of course, specifically the wedgie-cut style, which sounds unappealing but actually is the complete opposite--they're extremely flattering on the top and also let my calves ~breathe~ without being flares or boot-cut or wide-leg. Amazing, right? I'm going to end my Levi's spokesperson rant and note that these jeans saved my life and also transferred me to a beautiful jeans wonderland that allowed me to actually enjoy having my legs clad in a rigid fabric that is seemingly uncomfortable (but is really not!!). So now, I go against the norm that is anti-jeans. Isn't that what I normally do in fashion, though? While many of you agree with me and cherish your jeans with all your heart, most are all aboard the jean hating train. Which part of me understands--is it some sort of movement that's all about freeing the legs, sporting short skirts and flowing dresses to act as some sort of feminist movement (like the opposite of girls beginning to wear pants in the '20s and 30's)? Or even just a movement against denim pants; denim feels so overrated and maybe we should all begin wearing pants of different fabrics and styles, like velvet or of the side-slitted type. I completely agree with the latter argument, but then I think about all of the styling options that come with wearing jeans and I get overwhelmed in the best way possible. Pair them with dresses, with your favorite turtleneck layered under that going-out top, with a chunky sweater and neck scarf. And the shoes! Ankle boots, over-the-knee boots (if that's your forte), clogs, loafer mules. Sweater by Zara. Jeans and socks by Madewell. Clogs by Anthropologie (or try these other Anthro ones). Madewell has now forced me to own not one, but two, pairs of their black denim, which I have decided is ten times better than traditional blue denim. They're not only more ~business professional~, but they also pair well with denim jackets without doing that Canadian tuxedo thing that I don't always wish to pull off. The ones I'm wearing in the above two photos are their demi-boot style, which are so similar to straight-leg jeans but are so much more flattering and seem to be only fit for a cool-girl aesthetic that I do wish to pull off. There's a preconceived notion about jeans that you have to approach the look with a more is more attitude to make sure that overly-simple aspect of denim is eliminated. But what about embracing that simplicity? All I did to complete this look was to pair a ruffle sweater that imitates a pirate shirt (I now own two!!) with the cropped jeans and combine socks plus clogs, a combo I've been sporting since 2014. And... I'm already done. My usual self would frantically tie a neck scarf around my neck or wrist, or fit a turtleneck under that ruffle sweater, or ditch the sweater completely and pair a maxi button-up dress, buttoned up halfway (from top to middle) with the jeans. But instead I wanted to challenge myself from constantly adding items to a) make it easier on me and b) prove that I can make an outfit work with only four items (socks included!). Jean haters feel that they need to overdo their denim look to make it acceptable in this evolving fashion world, but I think its the opposite--let jeans be simple. That's why they were made. Maybe loving them will make your mornings that much easier. Phase III is here! If you forgot and/or are wondering what the hell phase III means, don't worry! I almost forgot about it, too. I've been doing a turtleneck challenge with J. Crew's tissue turtlenecks because a) I now own three of them and b) I'm always down to promote these babies not because I'm a victim of corporate consumerism, but because they're just that good. Everyone needs one (or five) in their wardrobes!!! Two weeks ago I proved their embellishing nature in Phase I by only revealing a rust-tinted neck under a victorian lace blouse, one week ago I proved their necessity by not daring to layer anything over it and pairing it with a mini skirt in Phase II. So it's about time for phase III! And unfortunately the end of this wonderful challenge I've had a blast doing (I hope you had just as much fun reading about it). If I owned ten of these, I would be extending the challenge to ten turtlenecks, and I'd even be able to give the turtleneck ten separate qualities, one for each color. My limited amount of turtlenecks (and funds) forces me to put an end to this, so I'm going out with a bang and revealing the convenience of these staples. Jumpsuit and tassel cuff by Madewell. Boots by Topshop. Most people's initial gut reaction to the turtleneck is oh, yeah, I should definitely start wearing these more because it's really damn cold outside. 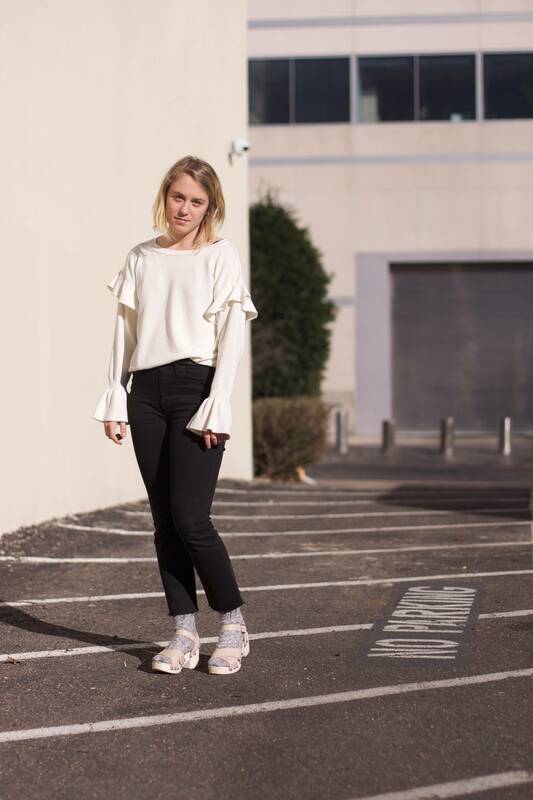 I always attempted to forget this primary purpose, mostly because I wanted to assign more universality to these tops (wearing a turtleneck in 60 degrees should be allowed, right??). But now I'm reassigning the turtlenecks purpose today, because here, I actually did slip this hot pink baby on because it was really damn cold. 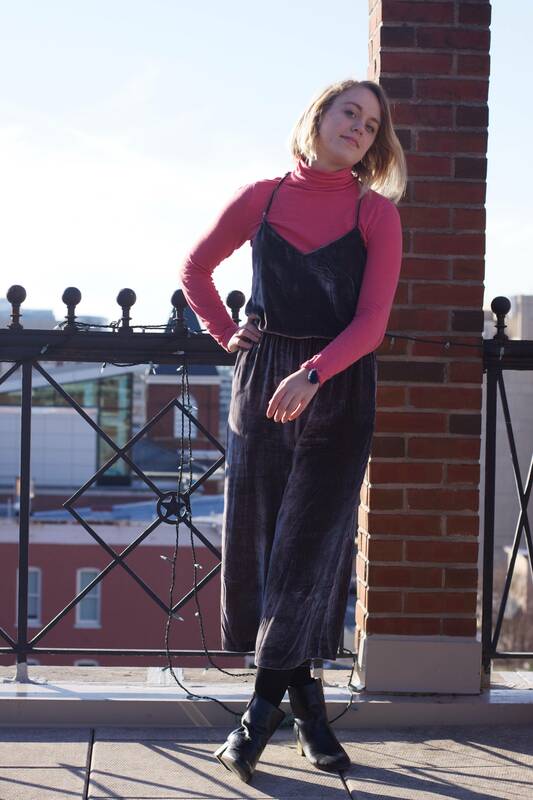 My regular readers should know that I don't let the cold stop me from what I'm wearing (like here and here), so I decided to wear a velvet cami jumpsuit, which is definitely meant for winter (imagine wearing this to an NYE party!! ), but the lack of sleeves say otherwise. So tissue turtleneck comes to the rescue! How convenient!!! I went for my pink one, not only because it was the last one left in the challenge, but also because I've learned that this bright hue of pink can really brighten up a freezing day. 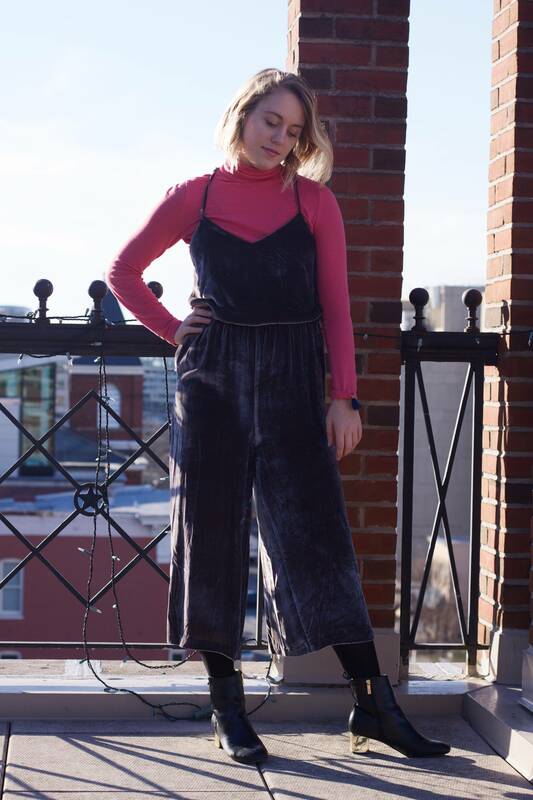 This tint of turtleneck alone could look like a 4th grader's dream, the velvet jumpsuit alone could resemble Bianca Jagger's #ootd, but combined, they represent my personal style. I told you these things were magical!!! I finished the look with the same boots I've worn this entire challenge, mostly because I'm still in that honeymoon phase with them that is bound to end soon, once I get myself a pair of loafer mules. And to really make this last day of my challenge go out with a bang, I took photos on a roof with DC staring at me in the background. I'm not sure if it's the pop of pink or the bright sun making this outfit look truly ~entrancing~, but I am sure that the sensation of the softer-than-a-cloud material embracing my neck did make me feel the most me. And I'm sure you'll feel that same revelation, too. Buy a few (or ten!) tissue turtlenecks here. Psa: this post (or challenge) was not initiated because J. Crew (or affiliated companies) asked me to do so, and I am not being paid or sponsored to promote these turtlenecks. I just really, really like them! I hope you will, too.